For modern food producers, ensuring that a date code is printed correctly and legibly on perishable goods has become of utmost importance. The consequences of getting it wrong are serious. Product recalls are expensive and ultimately even the most accommodating customer relationships can be seriously damaged if requirements on product quality are not met - potentially putting contracts and future business at jeopardy. For food exporters, supply legislation in many countries has seen new track and trace requirements previously only seen in the pharmaceutical industry now appearing in the food and beverage industry. Ink Jet coding and laser coding are far from infallible. The process of controlling millions of droplets of ink, or the transportation and handling systems which present the product to coders are always vulnerable to error. Static can cause print to be stretched or skewed; ink viscosity, product temperature, surface moisture on the packaging, are all factors that effect the reliability of coding. Typically, food producers rely on multiple manual QC checks performed periodically over the course of a shift or production run to ensure that codes are applied properly. However, manual inspection approaches suffer from a number of problems: Humans are bad at machine-paced work, and attention spans while looking at high-speed production lines are typically no more than a few minutes. Also, human inspection is inherently "subjective". Different operators are likely to make different judgement-calls when it comes to a product that's "marginal". With this type of inspection scheme - sampled and subjective - it is highly likely that defective product will makes it past inspection. 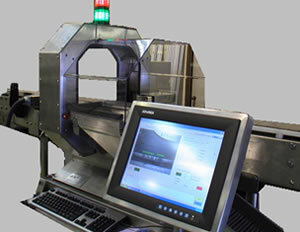 Automation & Robot Technologies (A&RT) have developed a standard date code inspection system designed to be highly flexible, but simple for operators to use. The system can be directly integrated to existing production lines with minimal effort and has the capability to inspect date codes / time stamps and other character inspections in less than 100 ms.
At the heart of the system is a Cognex In-Sight 5603 vision sensor with OCV capabilities. Combined with the ControlVision VisionServer HMI framework and Allen Bradley high performance Compact Logix PLC, the system can be easily integrated into existing line controls using discrete I/O, field-bus systems, and/or Ethernet protocols. Third party SCADA systems can be configured to collect production data from the Ethernet PLC and directly from the Cognex vision sensor if required. Line control can be supervised by the inspection system, and configured on a product by product basis so that waste can be minimized. The open architecture of the ART system means that quality control checks can be customized and extended easily with applications-specific requirements. This may include data collection from other inspection device such as additional vision sensors used for label inspection or cap/closure inspection, or x-ray or metal detectors. 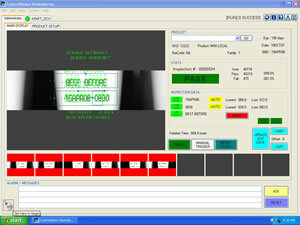 VisionServer provides a common HMI for the Camera, PLC and reject System. This HMI can be easily customized - without the need to program - and supports multiple user access levels. This allows staff members to be restricted or granted access to specific adjustments and settings of the inspection System ensuring your QC criteria is only modified by qualified staff members.